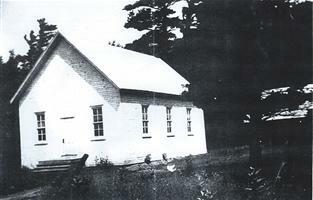 "The Little Church In the Pines"
The ministry of this "Little Church in the Pines" began in 1896. Very successful tent meetings were held that summer in a clearing surrounded by beautiful pines on property owned by John Anglin. Rev. Hamilton led the meetings and was assisted by Mary Moore and Cora VanCamp. During the winter months meetings were held in various homes in the community. The next summer, tent meetings were again held and, after many conversations, it was decided that the time had come to build a church. Construction began in the fall of 1897 and continued in the spring of 1898 on a lot donated by Walter Anglin, The church was constructed using mostly donated labour and was dedicated in March 1898 by Rev. Ralph Horner, Bishop of the Holiness Movement Church of Canada. This dedication ceremony must have been poignant. The joy of dedicating the new church was mixed with sadness, as the funeral of David See (son of David and Catherine See), was held on the same day. David See died as a result of being accidentally hit on the head by a timber while working on the church four weeks earlier. At that time, Chartered Members of the church and faithful pastors, carried the burden of the church. Chartered Members were: Mr. & Mrs. James Scholes, Mr. & Mrs. William Dillon, Mr. & Mrs. John Anglin, Mr. & Mrs. David See, Mr. & Mrs. Robert Maxwell, Mr. & Mrs. James Hill, Mr. Thomas Hill, Miss Lettie Anglin and Mr. & Mrs. Walter Anglin. In 1958, Rev. 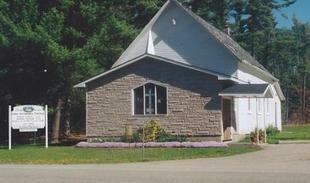 Donald Eyre, along with men from the congregation, raised the church and built a basement below, the old wood stove was replaced with a furnace, the church was freshly decorated and a new electric organ was installed. On January 1, 1959, The Holiness Movement Church officially merged with the Free Methodist Church and the "Little Church in the Pines" became a Free Methodist church. The church was rededicated in 1959. In 1973 the present parsonage was built. In 1976, there were additional renovations to the church which included the addition of a Sunday School area, new pews, carpeting, a washroom, a vestibule in the back of the church and a new entry way, A stained glass window was donated by Gwendolyn Kenny and Family in memory of Gerald Kenny. This window has now been relocated in the new Pine Grove Church. More recent renovations include removing the back wall of the sanctuary to provide additional seating for about 30 people. By 1995 a small but very devoted and unified group of about 25 people made up the congregation. Currently the congregation numbers between 150-200 people. In the mid 2000's Pine Grove Free Methodist Church changed its name to Pine Grove Community Church- to better reflect its mission statement "To be a caring community of believers who are committed to spreading the gospel of Jesus Christ in our community and beyond and providing a place of fellowship, where people can worship and grow in holy living as they feed on God's Word in an atmosphere of Christian love." 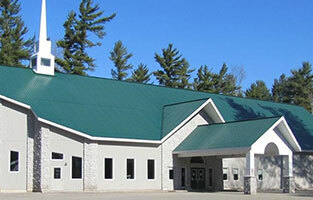 Pine Grove continues to pride itself as the "Church that Cares", and offers many programs which are open to its parishioners and the community at large. The new church was dedicated on Sunday March 25th, 2007. It too was built with many hours of volunteer help and many donated building supplies. The dedication of the church was also poignant in that we remembered: Rev. John Newton who suffered a heart attack while volunteering and subsequently passed away, Patrick Liston (Head Usher), Janice Mallen (Building committee Member), Al Shaver (Building Committee Member). On September 22, 2013 we celebrated the burning of the Mortgage. God has certainly blessed us as a church community and we give Him all the praise and glory.